Yes, I'll admit Mexican and Chinese fusion sounds a little strange. 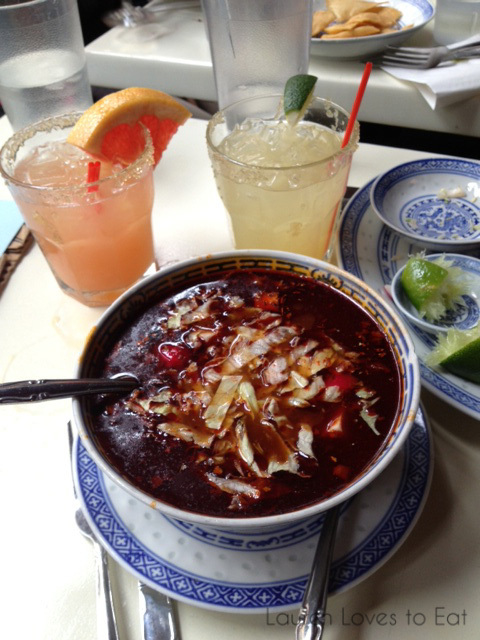 To be honest, I didn't even realize Barrio Chino had anything to do with Chinese until our first dishes arrived and I asked the bf why his Mexican soup was being served in an oriental-esque bowl. Then I realized there were Chinese paintings hanging on the wall. Ohh. (Forgive me, I took French in high school). Looking it up later, I found the translation for "Barrio Chino" to be "Chinese neighborhood". Besides the decor, plates, and bowls, all the food and drink served here is Mexican. For the hour and a half that we were at Barrio Chino, we noticed that tables were constantly being turned over, but it didn't seem like there was ever a wait for people walking in. Definitely consider coming here if you abhor NYC brunch waits. 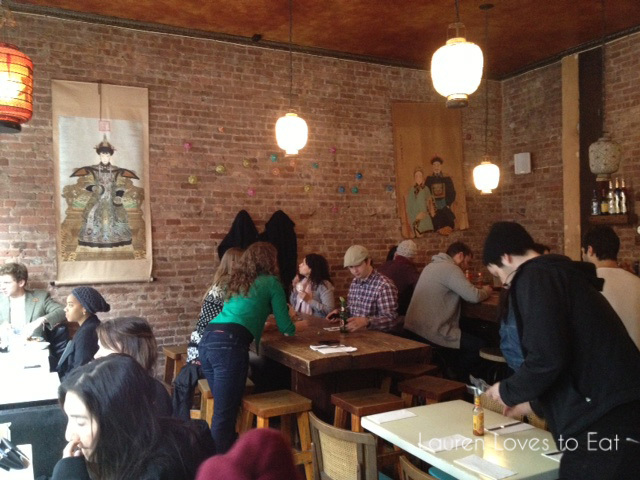 The restaurant is small and cozy, with simple wooden furniture and exposed brick walls. The big windows along one side of the room let in a lot of sunlight, ideal for taking pictures! 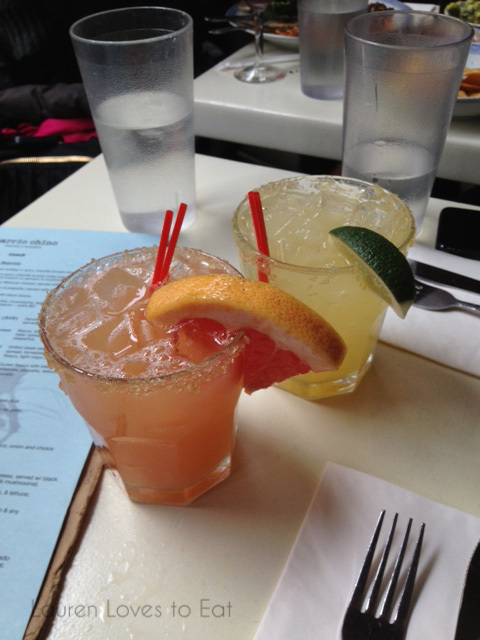 Grapefruit Margarita, Elderflower Margarita, (each $10): Barrio Chino is known for their great selection of cocktails such as margaritas, mojitos and caiprinhas, and for good reason! These margaritas weren't too sugary, and really did have a good kick to them. My bf has a thing for soups. And spice. This one was right up his alley. 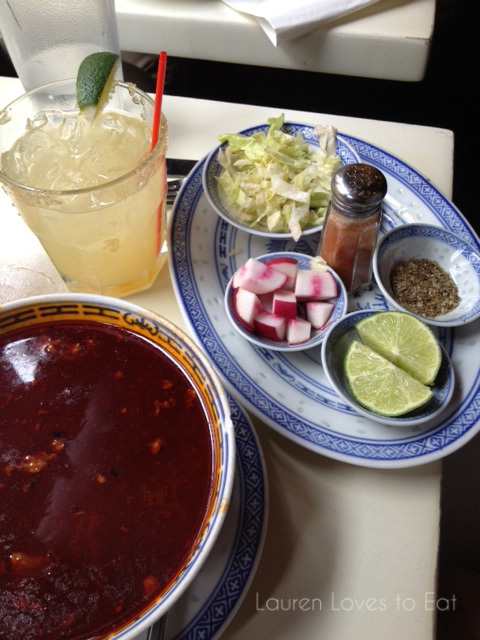 Posole, $8: Classic spicy Mexican soup with hominy and shredded pork. Served with Mexican oregano, chile powder, lettuce, radish, onions, and lime. I tried a spoonful and could barely breathe afterwards because it was so darn spicy. From what I could tell though, it was a great mix of flavors. 3 Chicken Tacos, $10: Grilled chicken breast marinated in garlic, onion, jalapeño with avocado salsa and cilantro. How I skipped over the word "cilantro", I do not know. When these arrived, my first thought was "ugh. How will I pick these out one at a time?" Aside from the cilantro, the tacos were decent. The chicken was a little on the dry side, but the avocado salsa made up for that. 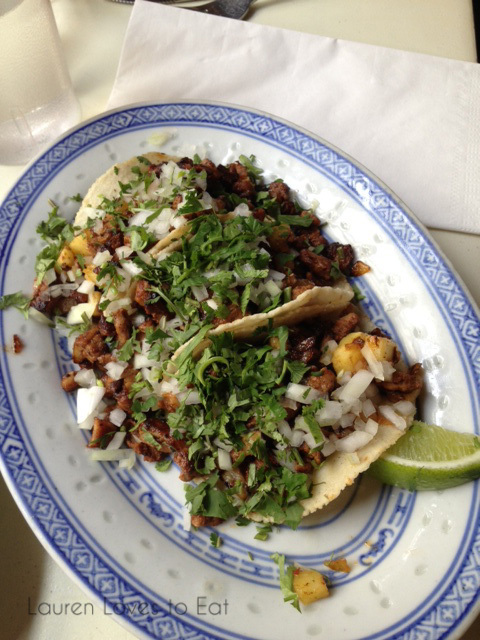 3 Pork Tacos, $10: Marinated pork grilled and served with fresh pineapple, cilantro, and white onion. Pineapple can make anything better. 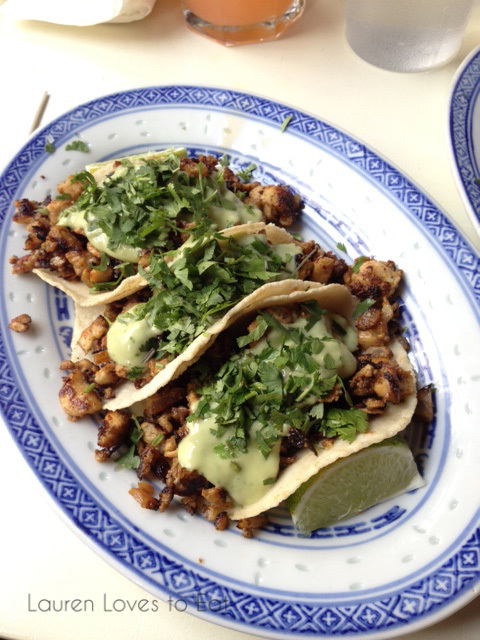 We loved the savory and sweet combinations of these pork tacos. I'd definitely order these again. 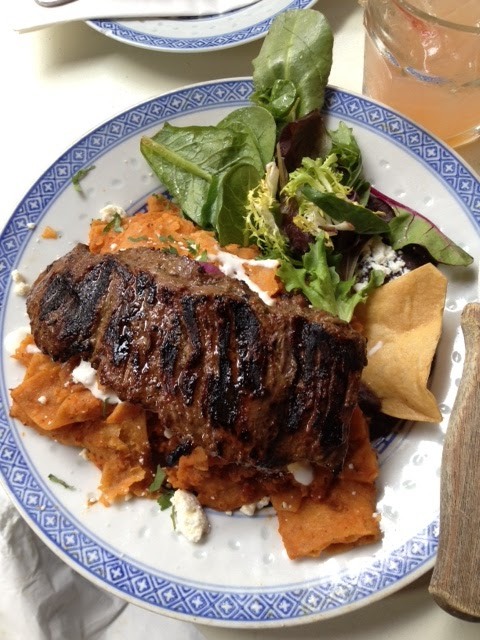 Chilaquiles Rojos, $15: Tortillas in a chipotle tomato sauce topped with crema, queso fresco, onion and grilled skirt steak, served with black beans. The steak was juicy and flavorful, but definitely too salty. The slightly soggy chips were the perfect complement. Chips are only allowed to be soggy when in Mexican dishes, as that just means they're drenched in good sauce. 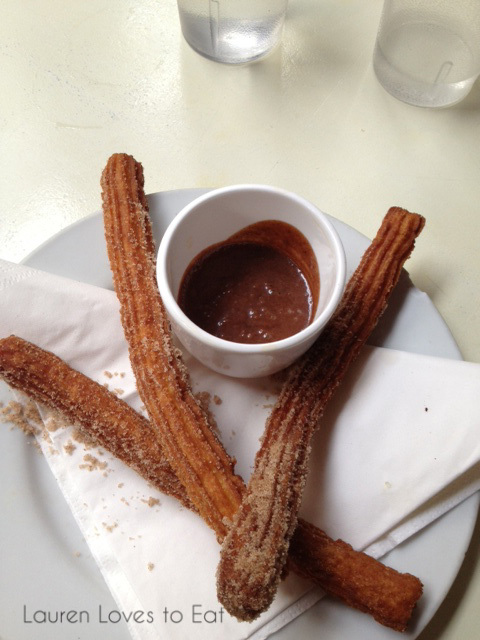 We were full, but when there are churros on the menu, how can one resist? Churros, $5. Decent, but not as stunning as the churros at Five Points. My God Lauren, I am drooling here. It's almost 6. Funny, I actually knew what barrio meant cuz I took Spanish, so the Chinese thing totally threw me off. I'm soooooooo going to this place. LOVE CHILAQUILES! Despite the dryness, the chicken looks awesome too. We still have to meet up... i'll drop you an email, I'm thinking next week or the week after. Chilaquiles are the BEST savory breakfasts!! And yes, let's do tea/cupcakes/brunch/drink! Next week works for me!